The First Sighting of Australia by the English. Title: The First Sighting of Australia by the English. "The Geographical Journal," April, 1934. The story that William Dampier was the first Englishman to set foot upon the mainland of Australia may be true. But there is sufficient evidence in existence to show that long before Dampier doubled Cape Lévêque in January, 1688, in the ship Cygnet, of London, English ships had traversed Australian waters and English seamen had charted islands lying close to the shores of the continent. "With the wind S.W. by W. steering by compass N.E. by E. at 10 a.m. the water was discoloured. A man at the foretop saw a breach rise ahead of us. We put our helm hard a starboard...and weathered the N.W. end of it about a mile...The breach that we first saw happened to be the northernmost of all, there being several and by our computation [they] are 20 miles in length. Within the breaches, several small white sandy islands were seen, with some bushes on them. A very heavy sea broke against the south part of these shoals. When close to them the mainland was not seen." It is evident, therefore, that Daniel was aware of the mainland's proximity. This was six years and a half before Dampier reached the north-west coast. At a still earlier date, however, English vessels had made their appearance in these southern waters. On September 4, 1621, the Trial (John Brooke, master) left Plymouth with a full cargo and one hundred and forty-three men on board for Java. She made slow progress towards the Cape of Good Hope, where she obtained refreshment, leaving there on March 19, 1622. Two months later she was wrecked on a ledge of rocks to the north-west of the Australian continent, where many of her crew were drowned. From that time the rocks on which she struck were placed in the charts under the name of the "Tryal Rocks." Hitherto very little information has been available relating to the events of this voyage, but I have been fortunate in finding at the India Office the original letter of Brooke to the owners of the Trial narrating the loss of the ship, together with another written by Thomas Bright, who had charge of the longboat in which a part of the crew escaped from the doomed vessel. [*] These are of considerable interest, for they throw new light on the fate of the Trial and the circumstances in which Australia was first sighted by Englishmen. The following extracts from the above-mentioned documents seem therefore to be worthy of record. "The 1st daye of Maye I sawe land being in. the latitude of 22 degrees, which land had been formelie seen by the Flemings and which laye in the cardes N.E. by N. and S.E. by S. from the Straits of Sunda. This island is 18 leagues long and we were all verie joyful at the sight thereof but finding 8 degrees variation by our judgment and Captain Fitzharbert's Jurnall that he went 10 leagues to the southwards of this Iland and being in this variation pestered by N.E. and by E. [winds] and fell [in] with the East end of Java..."
The land Brooke refers to was doubtless the point of the Australian mainland to the southward of North West Cape, in latitude 22° 42' S., known as Point Cloates. Owing to the trend of the coast here and the elbow in its outline, seamen on sighting it were unable to distinguish its true form or extent. Brooke, like the Dutch captains who first saw it, believed that it was an island. [*] He appears to have had on board a copy of the Journal of Captain Humphrey Fitzherbert, who, in the ship Royal Exchange, had voyaged to Java in 1620. We are told in the records of this voyage that "on the advice of the Flemings they sailed a more southerly course than any Englishman had gone before, which proved very healthful to the men. "[**] The Royal Exchange therefore had preceded the Trial into these waters, but in the accounts of Fitzherbert's voyage there is no mention that he sighted any land in this locality. "I take the opinion and counsell of my people when the winds came faire but havinge contrarie winde betwene the N. and the N.E. which held us from the 5th daye of Maie until the 24th of the same month, the great Iland with his 3 small Ilands at the Easter end bearing S.E. 20 leagues of us[*]; the winde veering to the S.E. and faire weather, we steered N.E. thinking to fall [in] with the wester part of Java. The 25th daye at 11 of the clocke in the night--faire weather and smoothe wetter--the shipp strooke. I ran to the Poope and hove the leads. I found but 3 fadom wafter, 60 men being upon the deck, 5 of them would not beleave that she strooke, I criinge to them to beare up and tacke to the westward: they did ther beste but the rock being sharpe the ship was presentlie full of watter. For the most part of these rocks lie 2 fadom under watter. It struck my men in such a mayze when I said...the ship strooke and they could see neyther breach, land, rocks, chainge of watter nor signe of dainger,--the ship sitting a good while after that I had hove the lead whilst I had brought my sailes a backstaies. Before she strooke the second strooke the winde began suddenly to freshe and blowe. I strooke down my sailes and gott out my skiffe and bid them sound about the shipp. They found sharp suncken rocks half a cable in length astarne, noe ground. These rocks are steepe to, so I made all the waye I could to gett out my long boate and by 2 of the clocke had gotten her out, and hanged her in the tackles over the side. Soe seeing the shipp full of watter and the winde to increase made all the means I could to save...as maniee...as I could...The boate put off at 4 in the morning and halfe an houer after the fore part of the shipp fell in pieces! the men were saved in the skiffe[**] and 36 in the long boate...I came awaie with my boate for the Straights. [***] My boate [i.e. the long-boat] stood back for the great Iland [presumably Barrow Island] which is 7 leagues to the S.E. wards of the place where the shipp was cast awaie." "...the boate found a little lowe Iland...I fell [in] with the Easter end of Java the 8th daie of June 1622: at Bantam the 21 ditto and at Jaccatra [Batavia] the 25th of the same month. 1 had one barrecoe a water, 2 casses of bottles, 2 runlets of aquavite, 40 li bread and for 4 Wes togeather so much raine and sea that our skiffe was allwaies 1/3 full of watter. The boate had 2 runlets wine, 6 barrecoes of watter, 2 casses of bottles and 1 C [wt.] of bread." "This Iland lieth false in his Longitud 200 leagues [sic. ]...as also these suncken rockes as by my draught will appear...A Dutch shipp the Armes of Horne[*] which came some month after me fell [in] with the land...This remote passidge the Dutch Generall doth not like, such over falles, weeds and ripplins which I and this Dutchman have passed!...and noe ground at 200 faudoms but in stormie weather in the night in some places, the sea is all in a breach." "May the 25th about X of the clock, night and fayre weather...Lattitude 20° 3'[*]...shipp...struck upon the rocks as soon, or before any breach discovered; billidged her hould full of watter in an instant...The long Boat with greatt difficultie wee gott out [there] being 128 soules left to God's mercye, whereof 36 [were] saved. Wee keeping till day some 1/4 mile or more from the shipp...the sea then so high, wee durst not...adventure to them and for that wee [were] so slenderly provided with provisions that [it was] impossible, without God's great providence wee should aryve at our wished [for] port...Upon sight of day wee espied a Iland bearing South East some five leagues att most from us...By all likly hoods land could not be farr by the fowle and weeds. ail that day drivinge from the Iland and rocks, to which said Iland wee went; stayed thereon seaven dayes for the freinge [freshing] of our boate and supplie of watter (having when we left the shipp but one barrecoe full, the reste emptie [there] being none but what the Lord sent per rayne). Not any inhabitants thereon. Wee travelled over all the land seeing nothing but Ilands, some small, some greatt, breaches and shoules every way as farr as wee could see. Very dangerous on the N.W. syde. To the S.S.W. of this Ile ther lyeth a great Iland[**] neere nyne leagues off." Captain Wilson, in the Vansittart in 1789, was the next who endeavoured to locate them, and began his search where they had been placed by the Danish captain; but he did not find them, and therefore concluded that if the rocks Captain Foss described "were situated within these limits" it was, barely possible that the ships Lascelles, Carnatic, and the Vansittart "could have passed without seeing them." Once again. the sea kept its secret, and, on hearing the result, Horsburgh was led to remark: "We are still left in doubt whether or not the Tryal Rocks...have any real existence." Geographers, however, continued to place them on their maps, even after sailors had given up the search as fruitless. 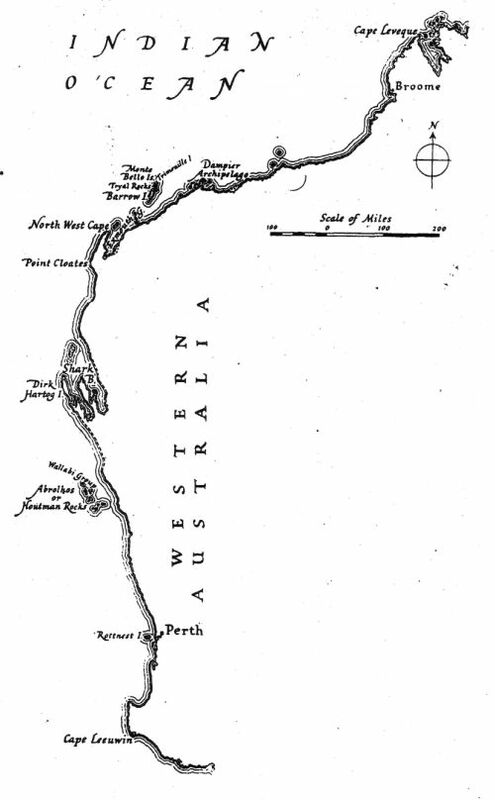 At last, in 1819, the voyage of the Greyhound on her passage from China to Port Jackson re-opened the question, her Commander declaring that he had met with a reef of rocks which were the long-lost Tryal Rocks. In 1820, acting under orders from the Admiralty, Lieutenant Phillip Parker King, in H.M.S. Mermaid, made a minute survey of the different situations where the rocks had been reported, and came to the conclusion that the Monte Bello Islands exactly answered their description, and he writes: "There remains no doubt in my mind but that Barrow Island in 20° 40' S., 115° 27' E. and Trimouille Island and the numerous reefs around them, are the identical Tryal Rocks." Since King's day naval surveyors have found their exact position. Admiralty Sailing Directions (1917) states: "Tryal Rocks awash at high water are near the outer edge of the S.W. part of Monte Bello Islands reef and 5 miles N. of the North extreme of Barrow Island." It is now difficult to realise that only seventeen years after Willem Jansz, in the Dutch ship Duifken,, had made what is known as "the first authentic discovery of Australia, thirty-six shipwrecked English seamen spent seven days almost within sight of the land which afterwards was proclaimed a British possession and became the home of so many of their race.